Welcome to The Cottage at Francis Marion University! 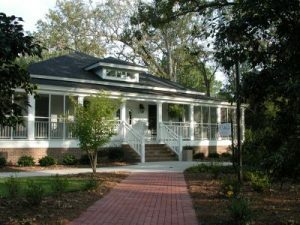 The BB&T/Amelia Wallace Faculty/Alumni Cottage is a 4,000-square-foot facility that serves as a gathering place for Francis Marion University faculty, staff, alumni, and guests. Set amidst the oaks, crepe myrtles, dogwoods and azaleas characteristic of the FMU campus, The Cottage is a quiet haven located between the Stokes Administration Building and the Stanton Academic Computer Center. Constructed in 2003 with private donations, The Cottage is a beautifully landscaped, modern facility with Southern low country charm that preserves the heritage of the original house that was located on the property. Operated by the FMU Foundation as a benefit to Francis Marion University, the facility is named in honor of BB&T, a major benefactor, and Amelia Wallace, whose family donated the first 100 acres of land on which the University is located. Serving as a focal point for faculty and alumni programs and events, The Cottage is available for use by faculty, staff and alumni or others with FMU affiliation. The perfect tranquil setting and ambiance for meetings, conferences, training sessions, special luncheons or dinners and receptions, The Cottage also may be leased by individuals and organizations as availability permits. Option 1: From Highway 301/76 heading east, pass through the 4-way intersection at the main entrance to campus, go about 1/2 mile then turn right at Gate #6 onto Wallace Woods Road. Take a right onto Cottage Road (Access Road) which will take you into Parking Lot F. Take a right all the way around the parking lot until you reach The Cottage, which will be the white building on your left. Option 2: Turn right at traffic light onto Highway 327 (Francis Marion Road) and left at Gate 2. Park in Lot E (directly ahead) and follow brick sidewalk to The Cottage. An Adobe Acrobat PDF file combining these directions and a map is available through this link. For more information about use and rental of The Cottage, please contact The Cottage at 843-661-1380 from 8:30 a.m. to 5 p.m. weekdays during the academic year, or from 8 a.m. to 5:15 p.m. Monday through Thursday from May 7 until August 12, 2018. Reservations must be made at least seven days in advance of an event. The FMU Education Foundation reserves the right to deny further use of The Cottage to any person or organization not complying with its policies and procedures. Aramark, the University’s dining service provider, handles catering for all special events. Outside caterers are not allowed. In addition to catered meals, Aramark can provide refreshments and beverage service for meetings or receptions. A bartender is required for events that utilize alcoholic beverages and will be arranged by Aramark for an additional charge. Complete menus and other catering information are available from Aramark. Catering arrangements must be made at least two weeks prior to an event by calling 843-661-1262 or emailing catering@fmarion.edu. Rental fees have been established for use of the entire facility or for lease of a single meeting room. Space may be reserved for the entire day, one-half day or by the hour. Cash, checks and credit cards are accepted. The rental fee is due at the signing of a lease agreement, along with a $100 damage/clean-up deposit. The deposit will be returned within 10 working days of an event, provided there is no damage and if all trash, decorations, and rental equipment are removed appropriately. Dues-paying members of the FMU Alumni Association, faculty and staff who wish to lease The Cottage for private functions are eligible for a discounted rate (excluding the guest rooms). Full refunds will be made on cancellations made to the FMU Foundation Office at least 48 hours prior to a scheduled event. Cancellations made after that time will be subject to forfeiture of the $100 deposit. Based on an agreement between the University and the FMU Foundation, all University-related special events scheduled at The Cottage are covered through an annual fee paid by the University and will not require individual departmental reimbursement for rental of space (excluding the guest rooms). For more information, please contact The Cottage Line 843-661-1380. Large Meeting/ Dining Room can accommodate up to 50 people seated. Small Meeting/ Dining Room can accommodate up to 12 people seated. The entire facility has a standing capacity for 200 people. All rooms include tables, chairs, and linens. A smaller meeting/dining room on the south wing of The Cottage is furnished with a large conference table accommodating 12 people. The table and chairs were donated by the FMU Alumni Association. The two large guest suites, both with queen-sized poster beds and private baths, are available for overnight accommodations for FMU faculty, staff, alumni, trustees, as well as guests of the University. The suites are nicely furnished for the comfort of guests. The Pepsi Guest Suite features a classic blue and yellow decor, providing a restful and serene retreat. The other bedroom is ultra cozy with its shades of reds, golds and greens. Guest suites are available on a first-come, first-served basis. One suite is accessible to individuals with disabilities. The Hendrick Room, named in memory of FMU physics professor Lynn D. “Skip” Hendrick, accommodates about 50 people for a seated dinner or meeting. Several individual tables seat six to eight guests each. The room is equipped with an LCD projector and screen for presentations. Additional audiovisual equipment is available if needed. As you enter The Cottage, the Founding Faculty Foyer welcomes you with the Yahnis Hospitality Suite to the left and the grand corridor running the length of the facility. The grand corridor runs the length of The Cottage and is made possible by private donations from faculty, staff, and friends is dedicated to the founding members of the FMU faculty. On either side of the foyer’s entrance are the Yahnis Hospitality Suite and the Powell Library. The Yahnis Hospitality Suite is made possible by a donation by Pee Dee businessman Christopher J. Yahnis in honor of his family. Lunch is served weekdays from 11:30 a.m. to 1:30 p.m. unless precluded by special events. Occasionally, evening dinners may be offered on a reservations-only basis. All food and beverage items will be provided by Aramark Food Services. The Yahnis Hospitality Suite opens into the Powell Library to combine for a casually elegant setting for cocktails and refreshments. The suite features the black and white photography of FMU graduate Walter Sallenger who is the grandson of Amelia Wallace. The focal point of the bar area is a grandfather clock donated by the sisters of Alpha Delta Pi sorority. As you come in through the front entrance, the beautiful Powell Library is immediately to your right off of the grand corridor. The Powell Library, funded by Karen Brosius and Willson Powell, is dedicated to Anne Willson Bethea Powell and Aurice Lynwood Powell. Around the gas fireplace are an overstuffed soft leather sofa and easy chair for a comfortable, inviting seating. Books in the Powell Library comprise a sampling of local history, South Caroliniana, Revolutionary Americana, and Francis Marion University imprints. The collection includes works by Pee Dee and other South Carolina authors and ranges from small but significant pamphlets to classic tomes. The volumes represent a blending of the traditional Southern plantation library with more contemporary but apropos works, including selected publications by FMU faculty members and bibliographies from the University’s James A. Rogers Library. Circulating copies of these “Cottage Use Only” titles are available for local check out from the Rogers Library. 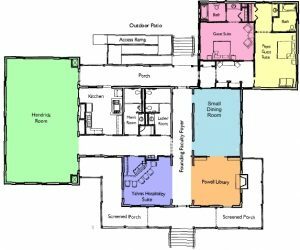 The Cottage floor plan includes the Founding Faculty Foyer, the casual Yahnis Hospitality Suite featuring a bar and grill, the large Hendrick Room which accommodates approximately 60 people for a seated dinner or conference, a smaller meeting/dining room that seats 12 people, the Powell Library, and two guest bedrooms with private baths – the Pepsi Guest Suite and a yet unnamed guest suite. The Cottage has hardwood floors throughout and features several furnishings, light fixtures and decorative accessories from the estate of Joan Gladstone, a longtime University benefactor. The front entrance to The Cottage can be accessed from the main campus through the Ashpy Lowrimore Memorial Garden. The brick walkway leading to the Southern-style screened wraparound porch features engraved bricks purchased by donors. The front porch is furnished with old-fashioned rockers. For outdoor receptions, the back porch opens onto a large bricked patio with fountain, a garden area featuring native flowers and greenery and a spacious landscaped lawn. The Cottage is equipped with a ramp and is accessible to individuals with disabilities. From Highway 301/76 heading east, pass through the 4-way intersection at the main entrance to campus, go about 1/2 mile then turn right at Gate #6 onto Wallace Woods Road. Take a right onto Cottage Road (Access Road) which will take you into Parking Lot F. Take a right all the way around the parking lot until you reach The Cottage, which will be the white building on your left. Turn right at traffic light onto Highway 327 (Francis Marion Road) and left at Gate 2. Park in Lot E (directly ahead) and follow the brick sidewalk to The Cottage.